Data is from the July 2016 CSO Insights and Seismic "2016 Sales Enablement Optimization Study." 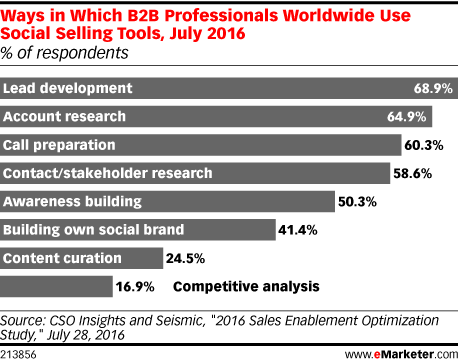 375 B2B professionals worldwide were surveyed during April 1-July 26, 2016. Respondents were from Asia (5.4%), Australia and New Zealand (6.0%), EMEA (24.2%), Latin America (5.5%) and North America (58.9%). CSO Insights is the independent research arm of MHI Global, dedicated to improving the performance and productivity of complex B2B sales. Seismic is a sales-enablement-based company.